Dr. Mehta is a Critical Care Physician and Respirologist at Mount Sinai Hospital. She completed medical school at McGill University in Montreal, Internal Medicine training at the University of Toronto, and Respirology and Critical Care training at Brown University in Providence, Rhode Island. 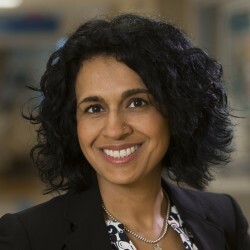 She is a Professor in the Department of Medicine, and a Clinician Scientist in the Division of Respirology and Interdepartmental Division of Critical Care, at the University of Toronto; and Clinician Scientist in the Lunenfeld Tanenbaum Research Institute. She has over 160 peer-review publications. Dr. Mehta’s primary research focus is on the administration of sedation and analgesia, delirium, and restraint use in mechanically ventilated, critically ill patients; as well as sleep, psychological and cognitive morbidity following discharge from the ICU. She is also interested in the perspectives of family members of ICU patients. Her research program has included clinician and patient surveys, prospective national multi-center practice audits, systematic reviews, and randomized controlled trials. Mehta S, Burry L, Cook D, Fergusson D, Steinberg M, Granton J, Herridge M, Ferguson N, Devlin J, Tanios M, Dodek P, Fowler R, Burns K, Jacka M, Olafson K, Skrobik Y, Hebert P, Sabri E, Meade M, for the SLEAP Investigators and the Canadian Critical Care Trials Group. Daily sedation interruption in mechanically ventilated critically ill patients cared for with a sedation protocol: A randomized controlled trial. JAMA 2012; 308(19):1985-1992. Burry L, Cook D, Herridge M, Devlin J, Fergusson D, Meade M, Steinberg M, Skrobik Y, Olafson K, Burns K, Dodek P, Granton J, Ferguson N, Jacka M, Tanios M, Fowler R, Reynolds S, Keenan S, Mallick R, and Mehta S for the SLEAP Investigators and the Canadian Critical Care Trials Group. Recall of Intensive Care Unit stay in mechanically ventilated patients managed with a sedation protocol or a sedation protocol with daily interruption: Results of the SLEAP multicenter randomized trial. Critical Care Medicine 2015 Oct;43(10):2180-90. Murray MJ, DeBlock H, Erstad B, Gray A, Jacobi J, Jordan C, McGee W, McManus C, Meade M, Nix S, Patterson A, Sands MK, Pino R, Tescher A, Arbour R, Rochwerg B, Murray CF, Mehta S. Clinical practice guidelines for sustained neuromuscular blockade in the adult critically ill patient. Critical Care Medicine 2016; 44(11): 2079-2103. Mehta S, Burns K, Machado F, Fox-Robichaud A, Cook D, Calfee C, Ware L, Burnham E, Kissoon N, Marshall JC, Mancebo J, Finfer S, Hartog C, Reinhart K, Maitland K, Stapleton RD, Kwizera A, Amin P, Abroug F, Smith O, Laake JH, Shrestha GS, Herridge M. Gender Parity in Critical Care Medicine. Am J Respir Crit Care Med. 2017 Feb 27. doi: 10.1164/rccm.201701-0076CP. [Epub ahead of print].